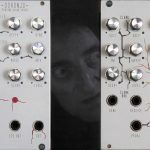 4sum is a simple, monophonic portable audio mixer with 4 inputs and 1 output with separated level controls for each channel. 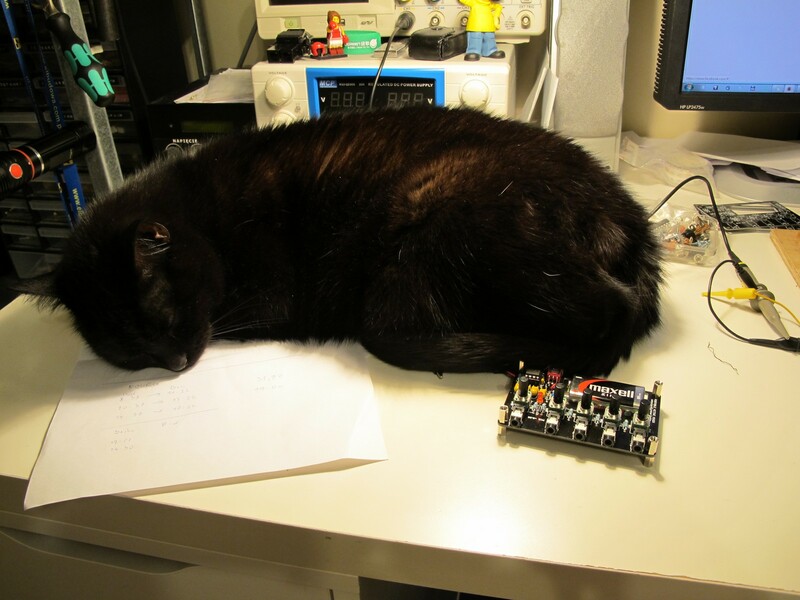 I designed this one for one reason: I did not have any mixer for my Monotrons and other “toys”! (Now you can get it at patch.audio). mono output for mono mixers (only one speaker plays after you connect mixer to amplifier). power supply from 9F22 batteries – quite cheap, popular, gives plenty of headroom and you can buy at as USB rechargeable! …is simple and effective. Signal is coming via one of four INPUTs and its level is set by LVLI1..LVLI4 potentiometers. R1..R4 are mixing resistors, C1 is removing DC on the IC1A input. IC1A and IC1B are cofigured as inverting amplifiers one with the constatant gain of one and second dependent on LVLO setting. Two inverting amplifiers connected in series will cause input and output signals to be in phase. R6 resistor along with LVLO potentiometer sets mixer amplification, from 0 to around 2. C2 with R7 acts as lowpass filter, removing DC component from the output. TLo72 is protected against shortcut, so no additional output resistor is needed. 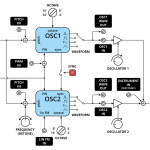 Biasing circuit is a standard voltage divider (R8 and R9) with C4 as potential supply noise remover. R10 and LED serves as circuit power indicator and D1 protects is against negative battery connection. The circuits heart is build around TL072 low-noise operational amplifier (obvious choice in many audio-related circuits). 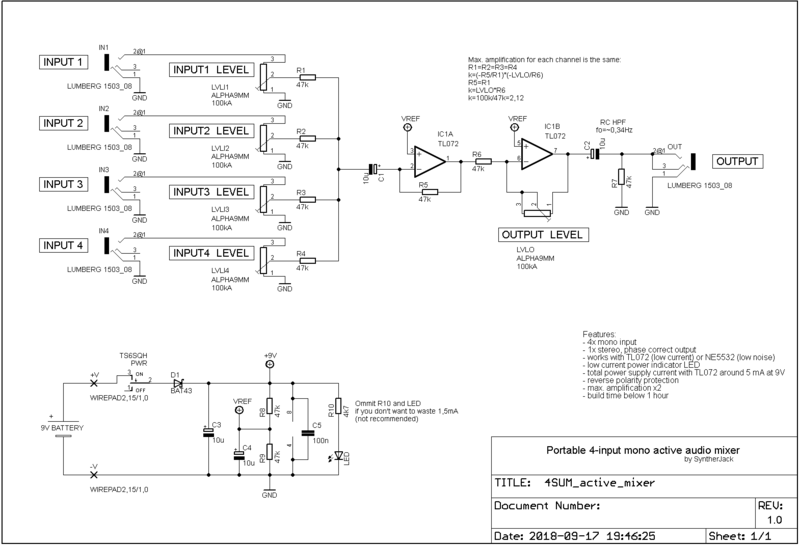 I just cannot justify use NE5532 opamp in portable application, less noisy, but 3x more power hungry. You can use it if you want, but device operation time will drop significantly (see tests below). The choice of 2x amplification ensure there will be no clipping for consumer (~0,9 Vp-p) audio level – slight clipping can be hearable for professional (~3,5 Vp-p) audio level and maximum amplification. 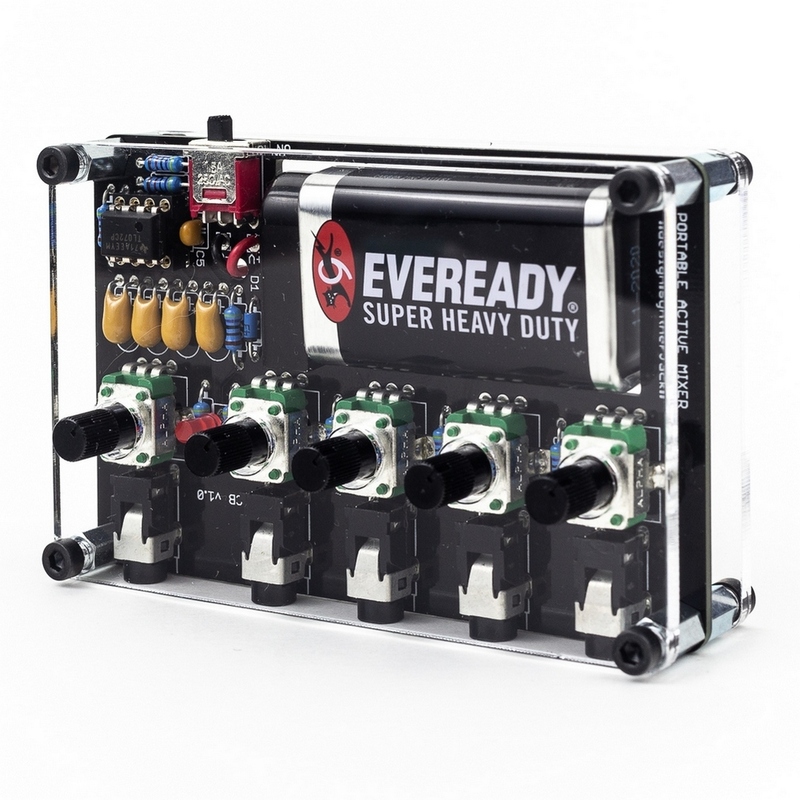 Unfortunately mixer will not handle eurorack hot signals around 10 Vp-p. 6F22 battery power supply for consumer audio level gives a headroom ~2,4 V ((5,6-0,9)/2), for professional ~1,1 V ((5,6-3,5)/2), which will drop as battery became to discharge (see tests below). One may say, output jack connection is oversimplified – two output pins (jacks tip and ring) are just shorted. The only negative effect is, if you plug mono cable (with ring and sleve connected), the mixers output is grounded (so there is no output signal). Opamp output is shorted to ground via C2, but thanks to protection IC survives 🙂 This could be solved more elegant way with output buffer, but then supply current would double. So the only real disadvantage is you have to remember to use stereo-stereo or stereo-RCA cable to interface the device you feed mixers output signal into. PCB size is 93×60 mm and was mostly defined by comfortable distance between potentiometer centers (16 mm). There are not many components but I’ve tried to place them in a way that no additional description is needed. 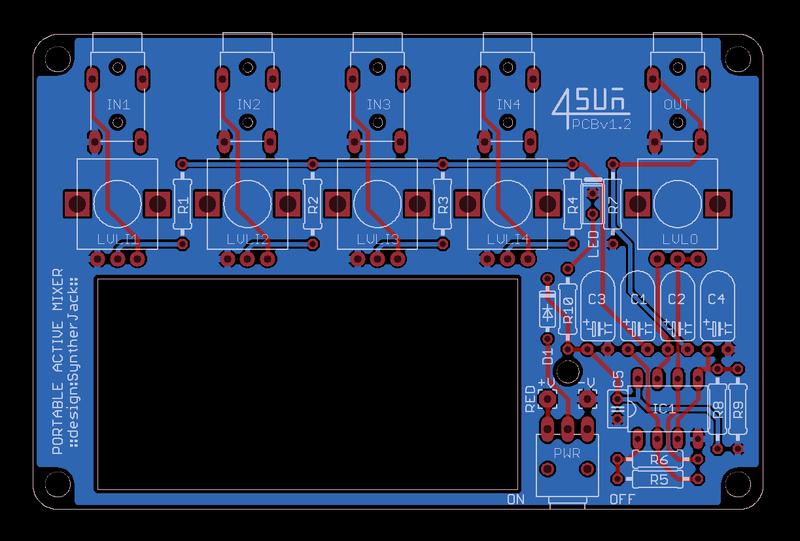 The unusual battery holder (I am very proud of) is build into PCB and takes advantage from devices “sandwich” design. I’ve fabricated 3 versions of the PCB: v0,98, v1,0 and v1,2, they differ from each other only in hole and captions placement. First two prototypes were manufactured at EleCrow, the final one at PCBWay. In both cases the quality was great. 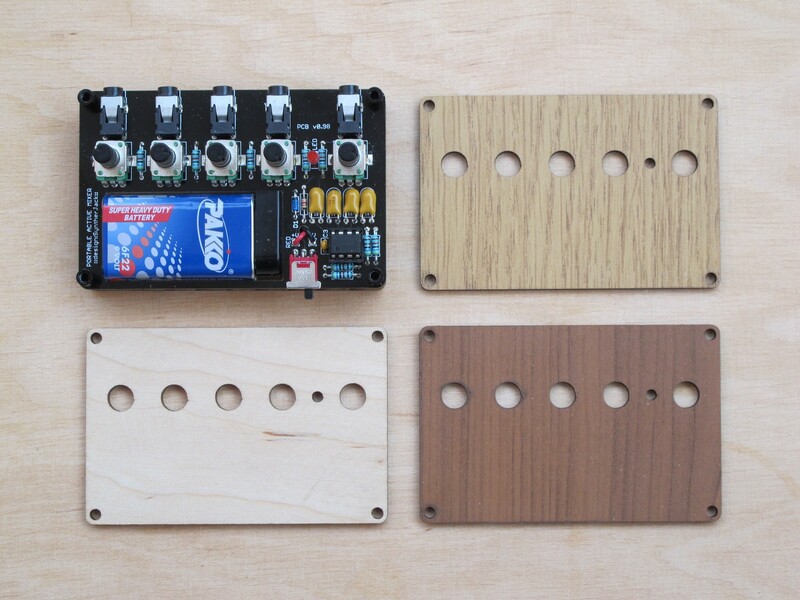 4sum prototype with replaceable real simulated wood and plywood panels. First prototype (photo above) used black finish 8 mm threaded spacers with round sleeve shape (from GearBest) – those needed two lengths of screws, as they came only in internal threaded version and I had to connect them somehow. The solution was too complex, round spacers were hard to source, so I moved to standard hexagonal. I used 6 mm M3 screws with imbus cut and cheese head, so you can screw them just with your fingers. You don’t need any additional tools. I had one more slight problem – high quality, machined IC sockets I wanted to used were to high to fit with 8 mm spacers. The next standard length was 10 mm, but then the whole mixer would become more bulky. Finally I decided to move to the cheaper socket type, that was lower and fit better under the panels. 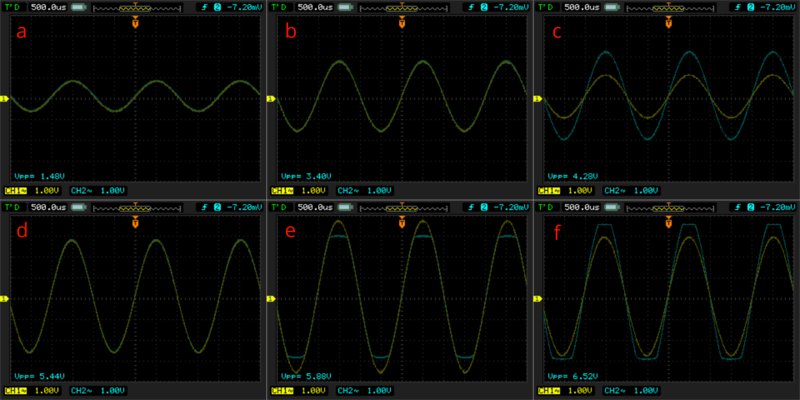 Because I love to play with oscilloscope, here’s something interesting: clipping waveforms. Each operational amplifier has its own parameter called “output voltage swing”. In the best case, with so called “rail-to-rail” amplifier, output voltage can swing exactly between power supply voltages. For example, popular “rail-to-rail” MCP6002 opamp, supplied from +5 V voltage source will give you maximum output of +5 V.
TL072 is not a “rail-to-rail” one and for +9 V supply voltage can output maximum signal of +6 V amplitude. Moreover, for TL072 in 4sum circuit and 9 V battery supply (decreased by protection diode voltage drop – check the schematic), the maximum input voltage is around 8,3 V. So, the whole circuit headroom will be defined by ICs output voltage swing, which is exactly 5,6 V.
Mixer clipping example – input voltage (yellow), output viltage (blue); a, b, c, d – output voltage within max. swing range; e – output voltage clipping because of too high input signal amplitude; f – output voltage clipping due to too much amplification (in both cases e,f opamp can’t output the desired voltage level, limited to around 5,6 V). headroom/clipping level vs power supply voltage: almost the same as for TL072 (see table). 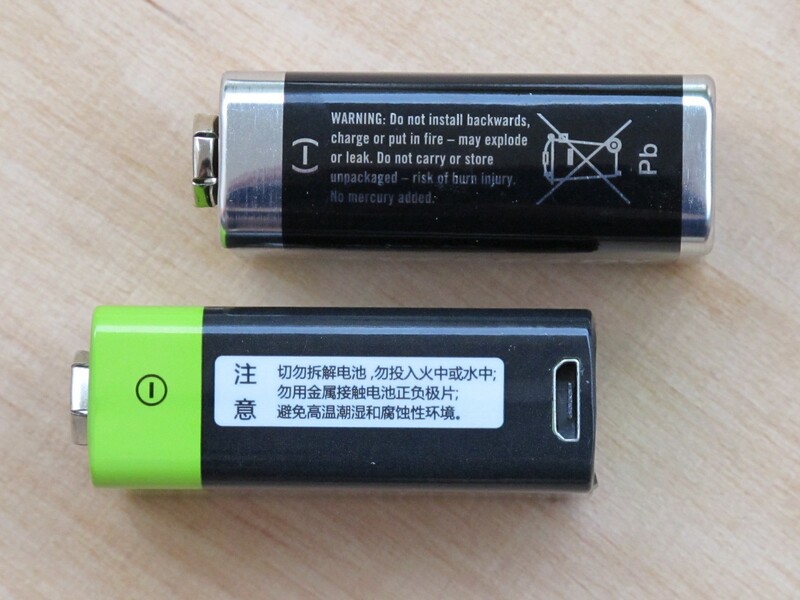 So, you can use NE5532 instead, but the battery life will drop (which should be not a problem if you use USB rechargable 9V batteries like the one below). The price for piece is ~8$ with shipping. Moreover, producer claims output voltage is 9 V, which is not obvious for rechargeable 6F22s (often it is a multiplication of 1,2 V). Because of used plexiglas panels, LED is soldered entirely under them (without hole like in wooden cut ones). If you don’t like tiny 6 mm diameter knobs, you can always put your own – there is enough space. In my opinion, as audio level controls they are allright (in opposition to f.e. filters cutoff or resonance – it’s too hard to find a sweet spot). works with rechargable USB batteries. And thats the end of my mixer story. 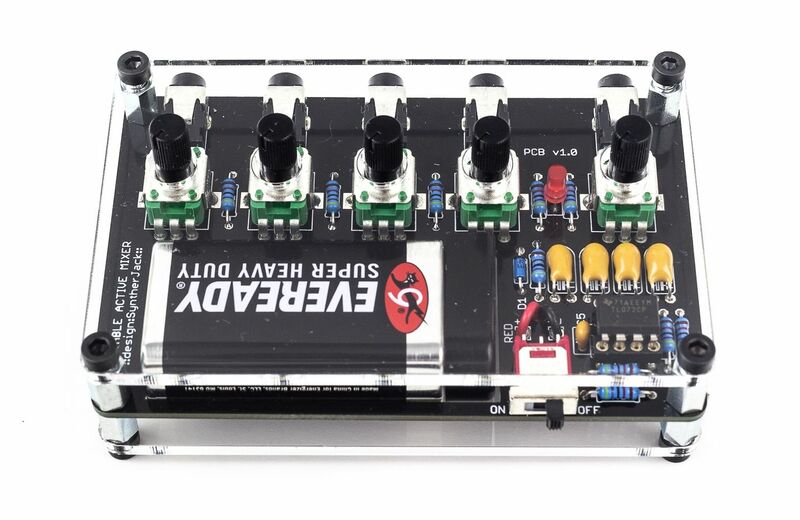 If you like it, you can get 4sum portable audio mixer from patch.audio online synthesizer shop as a full kit. You will also find there BOM along with building plans. Would it be possible to build a longer version with 6 or 8 inputs that split the first input into left and right (audio and sync) signals and then duplicated the sync signal into 6 or 8 separate outputs? I’m looking for a mixer that can be connected to two of these cases ( https://dichstudios.com/collections/po-gear/products/3po-case ) so that they can be folded with their button sides facing each other. The mixer would essentially be part of the hinge holding the bottom 3 Pocket Operator case to the top 3 Pocket Operator case. The plan would be to have it so that all of the Pocket Operators could be easily transported with all the cables already plugged in and the sync settings set up and ready to go. Could you build something like that and still get it to run from commonly available batteries? Can be done! I will let you know! 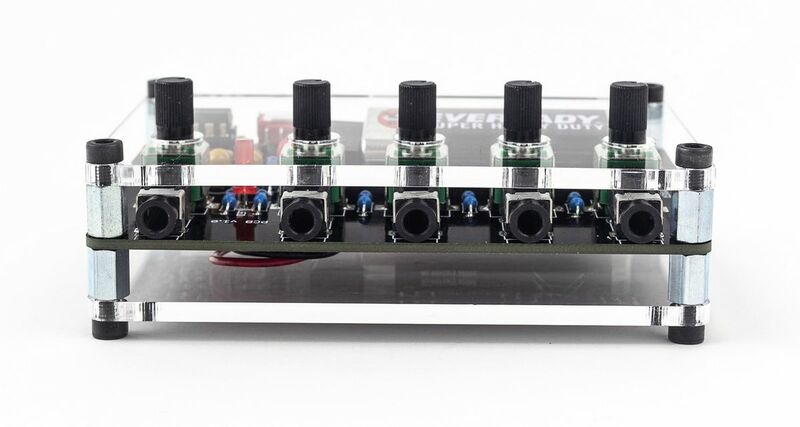 Just built one of these, fun little project .. just a few hints for anyone else that will get the kit: 1. you’ll need a hot soldering iron and fine solder – the resistor holes are a tad smaller than they could be, so be prepared for a bit of fine-work, 2. when you insert the potentiometers, be sure to solder one pad first, then double-check that the pot is flush with the PCB before you solder the next pad .. its boring, but it has to be said: you’ve gotta do one pad first, double-check, then the other. Trying to re-level after you’ve done both pads is a real bore! ;). 3. don’t forget the strain-relief on the battery cable, d’oh! :). 4. its a fun little mixer and really adds a level of control to a monotron setup that is badly needed. Nice one SyntherJack, happy builder here! Thanks for input! I will include your notes in the next generation of PCBs and manuals!